Share what you thought about Broken Pottery and earn reward points. 5 out of 5! Ms. Lynne has once again created a beautiful love story based around men who have real life problems that pertain to today&apos;s social climate. 4.5! 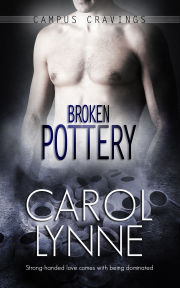 BROKEN POTTERY is the sixth book in the Campus Cravings series by Carol Lynne and it is my favorite. I highly recommend this story. This story was…wow...I adore Daniel and Tony together. Daniel needs, no he craves, the affection that Tony gives him. He&apos;s such a damaged soul that it&apos;s hard not to want to just coddle him. Carol Lynne has written a beautiful story. BROKEN POTTERY is a well-written tale, and a genuinely heart felt romance. I am quickly becoming addicted to her writing and I treasure this series.